Since Rangers downward spiral over the last year or so to the Scottish Third Division, our enemies have revealed themselves in spectacular fashion. We of course knew a few of them but it has been a revelation to witness the bile and hatred towards our club from many who we naïvely thought were our friends. I suppose I can accept the contempt from football supporters, I can handle that, it’s what football supporters do isn’t it? I have no love for certain Scottish clubs too. I believe that it’s actually a football fan’s natural instinct to dislike their rivals. What is unacceptable is the provocative bias and hatred towards Rangers Football Club from the Scottish press and our national broadcasters. In the past I have heard from many Rangers fans claiming that the BBC were biased against our club but I didn’t buy into this theory and always enjoyed the football coverage on BBC Sportsound. Not anymore though - because for many months now my opinion on this matter has been changing as it has been becoming blatantly obvious in the selective reporting of Rangers-related stories and one-sided discussion panels on Radio Scotland, that there is a definite anti-Rangers agenda in operation at Pacific Quay. 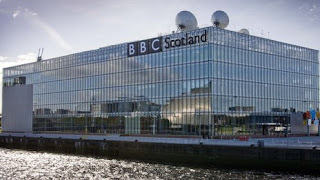 There has been no greater example of the BBC Scotland agenda driven production than Saturday afternoon, the day Rangers were crowned champions of SFL3. As is the usual practice when reporting the winning of championships, Sportsound produced a montage of the victorious club’s season. They did indeed play a montage of the Rangers' championship winning season but the content of the montage included audio clips of every single defeat in the cups and league campaign, and focused on every negative story from the season so far. They never covered one victory, “no, not one”. Even the much maligned Chic Young chipped in after it was broadcast to comment that it was worth pointing out that Rangers actually won some games, that’s why they are the champions after all. I have never heard anything so patently exasperating from a national broadcaster in all my life. Of course my view could be completely wrong and perhaps the BBC are indeed not biased or bigoted in anyway whatsoever. They could actually prove that to be the case in the next few weeks when Celtic inevitably clinch the Scottish Premier League title - by broadcasting a montage of the Parkhead side’s defeats to Juventus, Motherwell, Ross County, Kilmarnock, St Johnstone, Inverness, Hibernian and of course the League Cup semi-final defeat to St Mirren. I reckon the BBC Sportsound production team could teach the North Koreans a thing or two about totalitarianism.